This is the same as sim 3, but with a 20 degree relative inclination (star and companion in same plane, planet inclined at 20°). Just to see what happens if the inclination is between zero and the critical value of 39 degrees. This is the planet's eccentricity (pink) and inclination (yellow) after a million years using a 2k timestep. 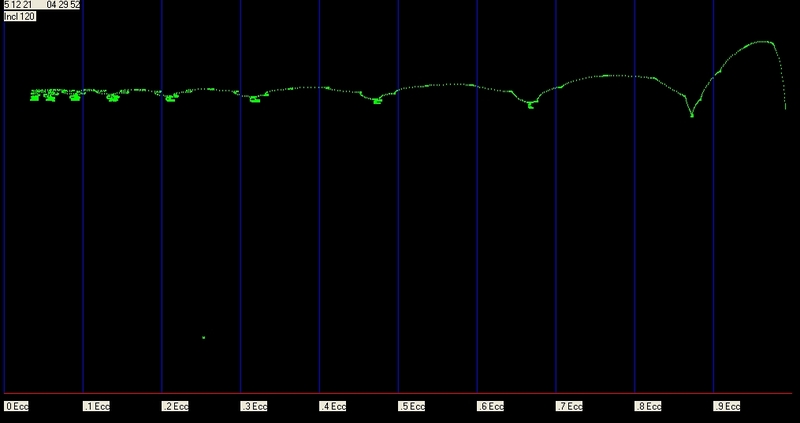 As you can see, it's nowhere near as 'clean' as the other graphs, the lines are very unsteady and assymmetric. Inclination is not constant, but that said is not varying by much. hi mal , I intend to make some simulations with the parker method to test for accurancy . Is it possble to get the initial values of position and velocities of this sim in x,y,z coordinates ? ok , thats fine , I can calculate the positions with this , however calculating the initial velocities gives some more problems while two big masses are involved and thus the sun is not fixed ...Any chance to get the excel-table with the initial velocities ? Gravity Simulator calculates the initial velocities for you, based on the orbital elements. Start the simulation paused, then go to Object > Edit Object, and the position and velocity vectors of each object will be visible. Is this following system a kind of Kozai influence ? If its not it shows a lot of dynamics , analog to Kozai. System consists of 2 "our" suns , orbiting each other at 0.2 AU , with a small eccentricity . An Earth sized planet is put in polar orbit around them at 1AU , also with a small eccentricity . The Earth planet leaves its polar orbit and regains it after about 350 years. Screen shots were made every 10 years . In the first part the system is viewed side-on, in the second part from above . Tony gave a formula to calculate the period of the Kozai cycle in one of the other posts . It looks like Pe= .....(1-e2^2) , among also factors with masses and major axis . It looks as if bodies with high eccentricities have small periods . So such bodies should show remarkable perturbations on small time scales . 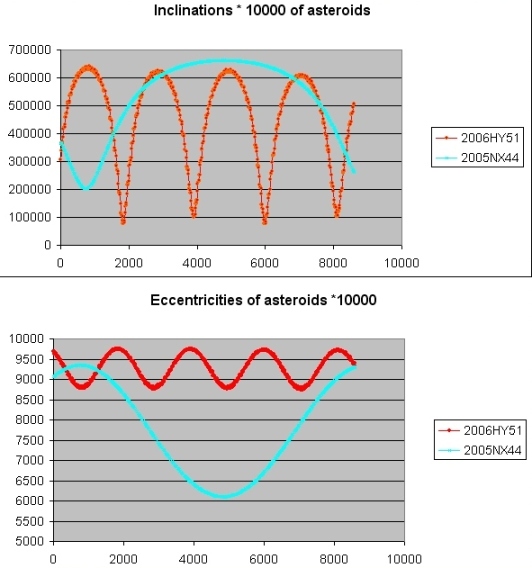 I selected the asteroid 2006HY51 which has the biggest known eccentricity of all asteroids . Wondering what the influence is of this rather quickly changing eccentricity and inclination on the threat to earth for collisions I ran the sim of 2006HY51 with all solar bodies (including the four big asteroids ) for almost 3000 years and got this picture . Evolution of eccentricity and inclination are corresponding to the simuation above , but what a difference the Earth Moid makes after 400 yeras ! . 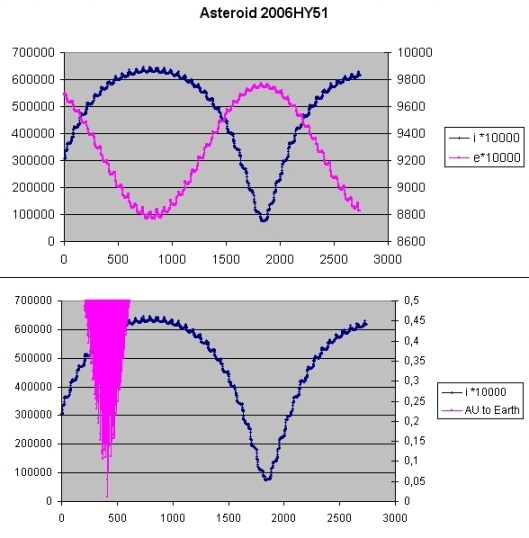 Whereas the asteroid now stays at more than 0.5 AU it will be come closer than 0.01 AU to Earth ! . So the Kozai mechanism may induce additional threats ! The plot herunder gives the evolution of the inclination vs. eccentricity of the simulation above ( The time goes from left to right ) . The plot was generated using the Gravsim output . One can see the moon performing small oscillations at low eccentricities initially These oscillations grow and eccentricity rises till at the end the moon collides with Earth . This evolution is not "straight forward " as at some times the moons eccentricity even recedes a liitle bit before it takes a jump forwards .